Researchers in the US have uncovered an intriguing electrochemical partnership between two bacteria, which boosts their combined ability to generate an electric current when they are grown in a bioelectrochemical reactor. The work could lead to more efficient reactors, as well as throwing light on the ecological relationship between microbes in the wider environment. 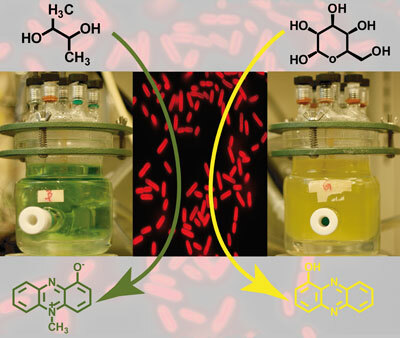 Certain microbes can metabolise organic waste in a way that releases electrons, which can be transferred to an electrode and used to generate electric power or in electrochemical reactions to make useful products. One common bacterium that has been investigated in such bioelectrochemical systems is Pseudomonas aeruginosa. In some natural environments, such as marine sediments, P. aeruginosa is found to be associated with another microbe, Enterobacter aerogenes. On the face of things, such a partnership appears unlikely as each bacterium has apparently different metabolic preferences. Now, a team led by Lars Angenent at Cornell University, Ithaca, has shown why these organisms can live in harmony in an energetically efficient way. Phenazines are three-ringed nitrogen-containing compounds that can 'traffic' electrons. One particular phenazine that 2,3-butanediol stimulates P. aeruginosa to produce in excess is pyocyanin. This is used by E. aerogenes to increase its efficiency of metabolism of its sugar substrate from relatively inefficient fermentation to respiration, which generates electrons that can be fed into the electrode of the reactor.